3. When you rearrange the bookshelves in your local shop so that all your favourites are face out. And you have to be dissuaded from standing by the section and talking to random shoppers. All day. 4. When you see the price that your local specialist is selling “The Giraffe, The Pelly And Me” and you phone your parents and ask them to take your childhood copy out of direct light. 5. When you take an hour bus ride to visit other libraries in your area because you’ve checked out their catalogue in advance and know that they’ve got the missing editions of the X-Men multi-volume you’re desperate to read. 6. And then you get the same bus back because you’ve got your books and it’s six hours until the next bus. Making your trip to the town last a princely total of twenty minutes. 9. And then staring at the floor and feeling the shame that comes when the doors open and said writer legs it. 11. When a writing conference is held where you work, and it’s full of the most wondrous writers who you adore, and every now and then one of them walks past your office door, and all you can do is make the 1st of 3938384 trips to the toilet that day just in the tenuous hope that one of them asks you for directions. To the place that they’re already at. Obviously, I’ve never done any of these. Ever. My books! 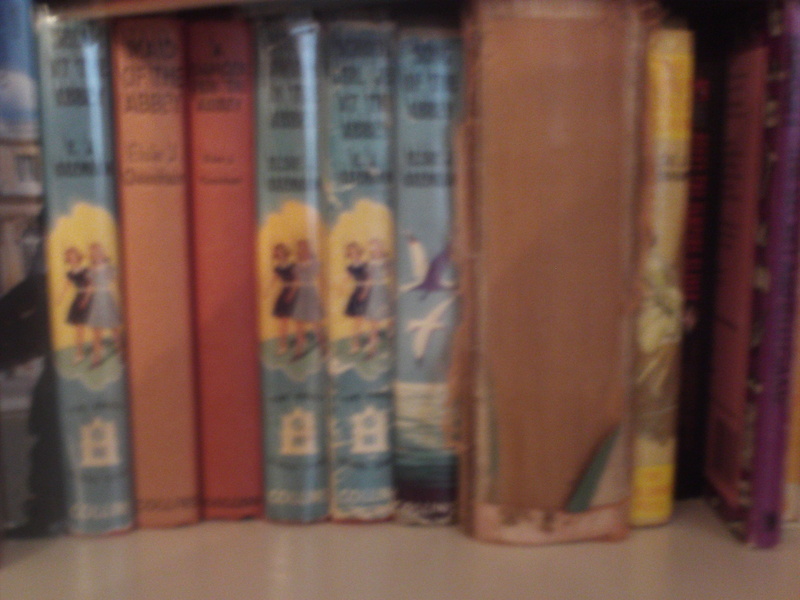 My lovely lovely books! Behold the heart of my Temple of Solitude! The left hand side is all Brent-Dyer, and a few Lorna Hills on the bottom. When you’re a book collector, you remember where so many of them came from. It’s almost as important as the book itself. My Chalet School collection is worldwide. I picked up Tom Tackles the Chalet School in Auckland (hyperventilating that I’d crossed the world to find a book I’d been after for ages), and I picked up my Armada paperback double of Jo Returns and New in Heathrow of all places. Running for a flight, I saw it on the bookshelves and I screeched to a halt. Caroline the Second came from Reading University archives (which I do reccomend if you’re a school story nut, they have some fabulous things there). An obsession grips you when you’re book collecting. You stare out the child in the shop and will them to PUT THE BOOK DOWN (in my defence I was only twelve). You want to complete the series. You need to do it. And then, once you’ve done it, you move on to the next. You move on to the EJOs, the Angela Brazils and even, in a fit of confused longing, you hit a May Wynne and an Ethel Talbot or two. (The one on the far right is a very bashed up Abbey Girls compilation which my Grandad once decided to duct tape together. My reaction to this suggestion is not appropriate to be shared). My birthday was this week. My amazing mum and dad got me a Kindle (best parents ever). There’s a small problem though. I think I’m this close to marrying the Kindle. But I love the Kindle with an equal passion. I love the way I can blink and have a book arrive in my hand. It’s literally (or should that be literary) magic. I am a hungry reader. I long for more than I have. Always will. I want that next hit. Reading is an addiction. It’s one of the nicer addictions but it is still an addiction. You want that next emotional hit. You want to sob your heart out, to fall in love, to live a life other than your own. You want it bad. I think the Kindle satiates that hunger and does it spectacularly. It’s perhaps a reflection of our want, take, have society but it does solve other problems of the modern reader. Sometimes I want the story but I don’t want the object. I rent. A small, poky once-garage with hardly enough room for myself let alone a thousand books. I spent half an hour of careful browsing, plus some excited burbling on Twitter, and came away with a Kindle packed with about sixty titles that I can’t wait to read. Sixty titles on a tiny tiny thing. It’s nuts. Thanks to the amazing Project Gutenberg, I snaffled books by LT Meade, Edith Nesbit, Alexandre Dumas (remind me to tell you about my obsession with ‘sturdy Gascon ponies’ sometime) and, naturally, a freaking ton of Angela Brazil (“Ethelreda, put down your trunk and come outside!” expostulated Marie-Heloise”). Now that I think about it there’s practically a PhD thesis in the use of speech tags in Angela Brazil but that’s for another time. I also checked out Amazon. Once you’ve registered your Kindle with your account (and I actually did this without realising I’d done this *technofailface*), you can browse the world of books they have there. Due to me being a true Yorkshire woman and therefore congenitally tight, I stayed away from the paid books and checked out the freebies. From a children’s literature perspective, there’s some amazing treats on there. A prequel from Patrick Ness, a short novel from Julia Golding … it’s worth spending the time to have a rummage through. Just don’t download Cybill Disobedience. Just don’t. I know it’s free but don’t. Trust me. Books are full of magic and pain. Of heartache and sorrow and (in the case of certain novels featuring the manliest of men making their manly way across Middle Earth – ILOVEYOUFARAMIRDON’TEVERGOCHANGING) unbridled wonder/lust. But sometimes you have to let them go. 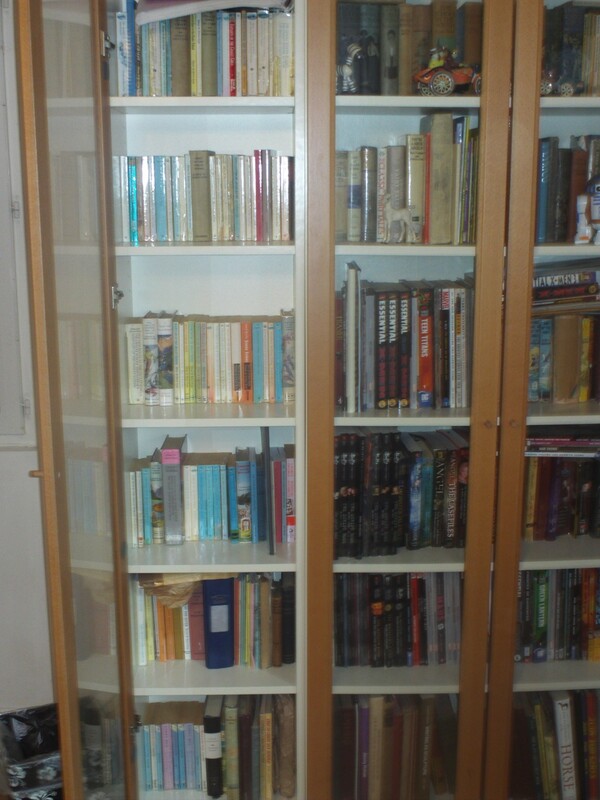 Space, place, shelf; all of these get too tight, too full, too crammed left-right-and-up-side-down with books. You lose titles in the madness, the glorious madness of titles that say nothing to the stranger but say everything to you; the title which made you realise you could love somebody, the title which made you weep, the title which you read curled tiny-small underneath the duvet clutching a torch and praying that your parents wouldn’t discover you were still awake. You paid for these moments of course, these moments which left you bleary-eyed and waking in Gondor but having breakfast in the cold damp light of day, but god they were worth it. These books, these books that speak of an era in your life, these books that stamped their presence on your daily existence. The horse books, the multitudinous horse books; the Pat Smythes, the sisters P-T, too much K.M Peyton to handle and that glorious glorious Encyclopedia of the Horse with photographs that satiated your desperate longing for a horse during those awful dry years of frugality and hope. You realise that it’s not the book, it’s the memory. It’s what the book symbolises, rather than the book itself. You’re holding onto the feeling, the memory, the days where you Jo-sat on the windowsill with an apple and had nothing else in the world to do but readreadreadread. Sometimes, and sometimes hurts more than you may ever realise, you have to let them go. You move out of home. Your parents move house. Your flat only has room for one Billy or two at the most. You want to live in a castle, all Beauty and the Beast ballroom wrapped in books, but you don’t. Not yet. Not yet. It will come but it’s not yet. So you share them out. Make piles. Awkward wobbling Guggenheim-esque piles of books and literature city-threading across your bedroom floor. You donate them to charity shops, to the kids next door, to the school where they’re desperate for books, to anybody who can let these books live again. 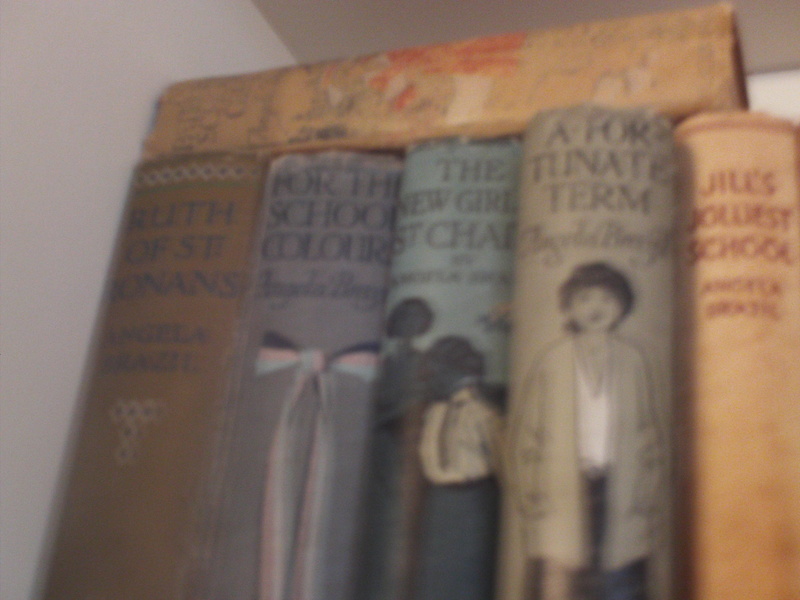 And then, maybe fifteen or twenty years later, there’s that wonderful moment where you stop and you look and you see the photograph of your bookcase as a child and you see the title, you see the spine of a Follyfoot or the edge of a Bunty and you know. You want these books back in your life. It’s a self-flagellating experience, book-collecting. But this moment. This moment when you remember it all, crystal-clear clarity, love pure and vivid rises in front of you and your fingers itch to read them again. And you know what? You’re going to get them back.